So what went wrong? Choosing both coordinates independently fails to take into account that not all latitudes have the same circumference and, accordingly, their differential area varies. Simply put: there are more points to be put on a latitude near the equator than near a pole. So a method of mapping randomly, but uniformly spaced, points on a sphere must take this basic observation into account. Let us simplify the problem by considering we are working on a unit sphere, that is, a sphere with a radius of 1. Let us suppose that the South-North axis is the Y axis. Then the sphere goes from -1 (the South Pole) to +1 (the North Pole). To distribute points equidistantly on the sphere, we have to know the differential surface length between two given latitude, and to do so, we will need to compute a surface of revolution (that’s calculus 201 or 301). That’s a lot of work, but it was completely worth the effort. Calculus, and math in general, is quite a powerful ally of the good programmer—even more so of the computer scientist—but it seems that many C.S. programs do not take math seriously enough. When doing my B.Sc. (maybe I wasn’t the best student ever, but that’s beside the point here) we only had 5 courses on a total of 30-something. We had a calculus course which had more or less the same contents as the two cégep courses and as such wasn’t that useful, a course on linear algebra that was also pretty dismal (I have quite a few stories about the lecturer), a course on probability and statistics, a course on statistics, and finally a course in discrete mathematics (the one I enjoyed the most, by far). Overall, it all seems a bit thin for people who will manipulate information for the rest of their lives, even if only to generate random numbers. Let me end this digression by enjoining my readers, all of you, to question the quality and depth of your mathematical education and, if you’re still studying, to ask yourself what better math could do for you, and what means you should take to better your skills. I do that too, all the time, so it’s not like I’m saying I’m much better than you. This entry was posted on Tuesday, October 12th, 2010 at 14:57 pm and is filed under algorithms, Mathematics, programming. You can follow any responses to this entry through the RSS 2.0 feed. You can leave a response, or trackback from your own site. (2) The resulting vector distribution is dependent only on the radius (immediate check), so it suffices to normalize it. This approach has the advantage that it is easily generalizable to any dimension. The “clumps” are the result of projecting a cubic volume onto a sphere. 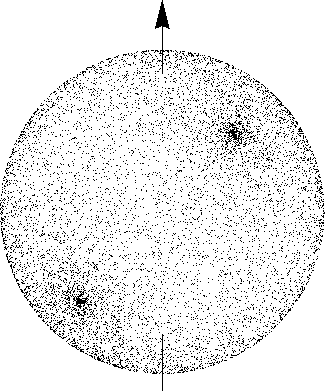 If you reject the points outside the sphere (mag>1) as you generate them, you get an even distribution. 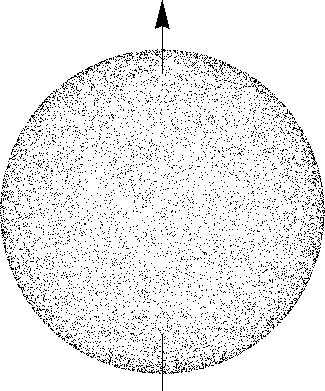 My immediate idea would be to use a variation of the method I presented in the post, but generalizing it to spherical shells (depending on radius) rather than circumferences (depending on lattitudes). 1) Generate point in cube – reject points outside sphere. First, generate a point on the surface of a sphere, THEN choose a radius. The rejection method is very bad. The ratio of the volume of the sphere to the volume of the bounding (hyper)cube goes to zero somewhat fast as the number of dimensions increases (see comments below). In other words, as you increase the number of dimensions, the number of retries increases as well. As for 2), I’m not sure that’s the way I would derive the equations. While this may be possible, it would be very hard to generalize to an arbitrary dimensions. When I needed a solution some years ago, I came across Roger Stafford’s incredible solution. Here are some (too few) words of explanation. Note that Matlab’s gammainc function is commonly referred to as the regularized-lower-incomplete gamma function, so the code may seem misleading at first sight. Would’nt a method based on rejection be efficient? Do the corners of a cube bounding a sphere grow or shrink as we add dimensions? The ratio n-ball-volume/n-bounding-cube-volume goes to zero as n approaches infinity, so rejection grows more and more inefficient. I believe there are a couple of issues with your surface of resolution mathematics. The integral should reduce to 1. There is an easier way to derive the above. A = area of sphere. so theta = arcsin A, maybe with a scaling factor to put it in the range -1 to 1. I don’t like the arcsin, as you lose some resolution, i.e. d(arcsin(x))/d(x) goes to infinity as x reaches +-1. That means the values of theta generated will fall into certain values with gaps between. 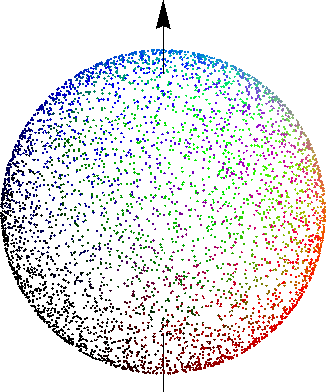 There’s a totally different way of generating points on the surface of a sphere. This would also work with higher-dimensional spheres. Start with a vector of a point on the surface, and rotate it randomly. Where theta is uniformly distributed in the range -pi to pi. In fact, the way this works, it can be uniformly distributed in ANY range, but a small range means you have to do more work before the coordinates are sufficiently random. Do this a couple of times and your point (vector) is randomly distributed on the surface of the sphere. There are variations, involving randomly choosing which elements of the matrix to put the cos(theta) and sin(theta) in, ensuring that it’s still a rotation matrix. Rounding error might give points marginally off the surface, so you can normalise the vector if you want. Essentially, the above generates a series of vectors, each one a random rotation of the previous vector. The individual transformations won’t necessarily be uniformly distributed, but the series will. This will free you from dependence on latitude and longitude, not particularly nice coordinates as they don’t behave gracefully, i.e. 2) a small movement of the point occasionally means a massive change in theta and phi.